You, as a working reporter. It's your first day on the job (though your name isn't Josephine Bob). Your new office manager has given you three days worth of depositions, all in different cities, at different times, with different attorneys (yes, this is your trial by fire!). How do you keep track of all these appointments, names and addresses? 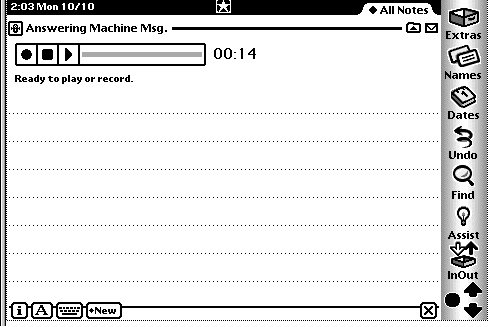 Why, that's easy: You just use some Old School tech from Apple, called a Newton MessagePad. 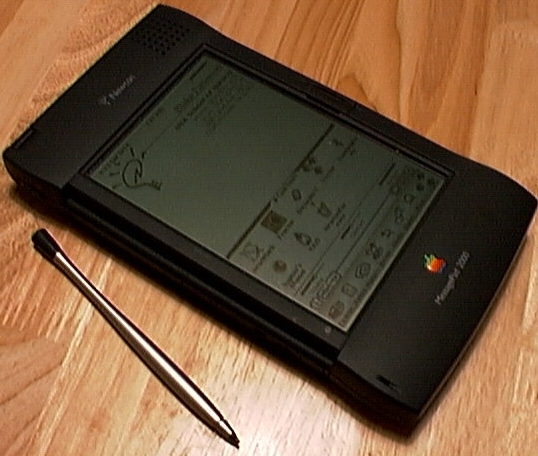 The Newton was Apple's foray into the PDA market back in 1993. While it is true that the Newton was killed off (or "Steved," in Apple-speak ... which refers to something being killed off by Steve Jobs, Apple's i ("interim") CEO for life) back in 1997, the Newton still lives on in the hands of a few dedicated users -- many of whom write software for what should by all rights be a dead platform. But to paraphrase the words of Mark Twain, the news of the Newton's death has been greatly exaggerated. "But What About the Palm Pilot?" That is a big can of worms ...! Both the Newton and the Palm have their rabid fans. If you wish, do a Google search for the phrase "Newton vs. Palm" sometime. Both camps defend their PDA of choice to the death (with an upwards glance at that last picture by our friends from the Great White North)! For me (and my fellow rabid Newton fans), the difference is in the handwriting recognition. The Palm uses something called Graffiti, which are special strokes you have to learn so that your handwriting can be recognized by the Palm. On the Newton, you just write, and (with a bit of training via the Newton's Handwriting Trainer application), your handwriting is translated pretty quickly. Another consideration is battery life. The Palm's battery life is good -- about three months (that is, if you don't use the backlight). In contrast, the Newton's battery life lasts about 36 hours with continuous use ... a bit less if you get too happy with the backlight. Average use should give you about two or three months of battery life. "So I should get a Palm, right?" Let's say you have a Palm Pilot, and your battery dies. You're too sleepy to drive out to get new ones to replace them, so you say you'll do it tomorrow. Tomorrow comes, and you get your batteries and put them in. Your Palm comes on, and ... all your data is gone! Not just your notes and appointments, but also all your programs -- all gone. This happened to Charity "Gemini Girl" Chainus recently. The Newton has a backup battery. If you take the main batteries out of your Newton and put it away (say "lose it") for about six years, when you put new batteries in, it will turn on, all your data will be there, and so will all your applications. So no, I wouldn't recommend the Palm. I probably should say something in defense of the Palm here. While all of your data will disappear from the Palm if the battery dies, it all (less stuff you haven't backed up) can be restored. But, since I'm a "rabid Newton fan," I must say that the idea of a backup battery has been a part of the Newton since ... well, at least 1995 ... and yet, all the data on a Palm can still be killed off for the lack of a $3.00 battery -- a design idea that has been available since at least that time! Come on, Palm guys (and gals). You can do better. Back in my days as a Web Design and Development student, I sat next to a woman named Debra. I'm not sure how, but somehow I lost a bet to her. My penalty: "Remember me on my birthday," she said. Turns out her birthday was two months away ...! "How am I going to remember that," I asked myself. "along with all this stuff they're trying to cram into my head?" And then it hit me: My Newton! Of course, I asked her a few questions ... like her year of birth (since she had already given me the date), her e-mail address, and (most important) the proper spelling of her name. I dutifully recorded all this information using this rather quaint piece of technology you may have seen someone use on TV: That's right, I'm talking about pen and paper. The more astute of you might have noticed that my story was about a woman named Debra, but the pictures are talking about a woman named Vicki ... and you're wondering why. Why, that's simple: Debra's birthday was 4 months ago. Vicki's birthday is (as I write this) tomorrow ... and I'm too lazy -- er, I'm too busy updating ol' Cheap and Sleazy to turn the date back (yeah ... that's it ...!). And that, ladies and germs, is how I keep track of the birthdays of my friends and acquaintances, so I can send them my annual Happy Birthday E-mails, to which there are no attachments, gifts, or anything else. Naturally I'd prefer that you not tell any of those friends and acquaintances my little trick; they all think I have this phenomenal memory, see ... and I don't want to spoil the illusion! Well, as a working court reporter, you can use the Newton to keep track of your scheduled depositions, including time and place, case caption (as in, "Smith vs. Jones"), the names and spellings of all parties and witnesses, etc. "What Else can I do With This thing?" How about learn medical termminology? That's right: I used my Newton 2100 to take notes during my Medical Terminology class (and Legal Terminology as well). More importantly, the program I used to take those notes allowed me to create my own questions and study the questions and answers. The program is called Learn Fast. Did I mention this program is free? It even has something called "Quiz Mode." While the idea of the "Quiz Mode" sounds like a good one, if you have a 20 word answer and make a word substitution for one of the words, your answer will be counted wrong ... so I just used the Quick Review mode (pictured above). I used a Newton Keyboard to enter about a quarter of this information. 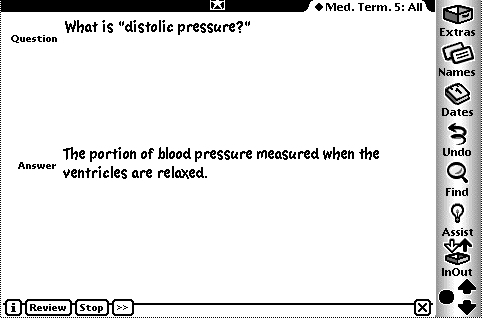 While the Newton's handwriting recognition (HWR) is good, I sometimes find some disturbing gaffs in my medical terminolgy notes ...! Did I mention I got a B in the class ...? I also used another program from the brilliant Paul Guyot (that's right: The same guy that wrote Learn Fast), called "alt rec", which allows me to take an ending like 'ectomy' and match it to a shortcut like "ekt-". It may be tough to see, but if I write "s/w," alt.rec will translate that for me to "software." If I write "approx-," alt.rec will translate that as "approximately." It's kinda like briefs, actually; quite handy! Take a quick look at the very first picture of the Newton in this piece. Look at the 5:00 (lower right-hand corner for those of you used to digital clocks) position. Do you see that little line there? I had my first 2100 for about six months before I found out that that little indentation there was a microphone. This particular recording is of my rommie's Significant Other's impression of Hannibal Lector ... which greets anyone who calls! 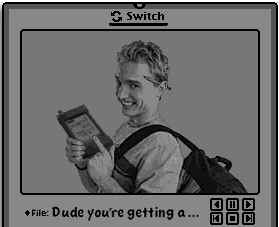 I'll see if I can figure out a way to get the sound out of my Newton and onto this web page ... one of these days. If you read that bit in Got Fear? about how on the Mac, that *&#!! assistant in Word can talk to you, you know a little bit about MacinTalk. 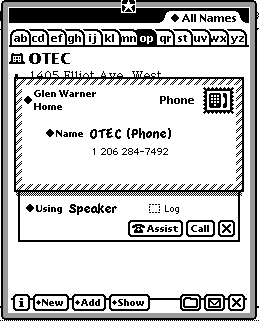 Well, with MacinTalk installed on your Newton, it can read text to you. Here, I have it set to "sing" a little bit from "Rocky Horror Picture Show:"
As you might have noticed, there are some, shall we say, different spelling and punctuation in that little snippet of "Don't Dream it (Be It)." Those merely aid in the correct punctuation of the words in the song. When I click on the "Speak Text" menu item, the Newton will start singing -- er, speaking. The big RH fans probably noticed that I screwed up the lyrics there, but that's okay. Normally of course, I would write what I want, and select "Speak Text" and not worry about spelling for pronounciation or adding extra commas for musical pauses, as I did above. Useless? To some. But this would be *great* in LearnFast --! Too bad it doesn't work. All it says is "Q. A." I'd complain to the author, but Paul Guyot is working on his Ph.D. (did I mention he's 24? ), and a much bigger project these days ... so I won't bother him about this ... yet. "Cool --! So what else can I do with this thing?" Well, howzabout use it to wake yourself up? 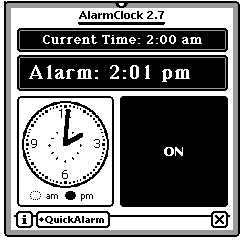 AlarmClock is not part of the Newton operating system; rather, it is a gift to the Newton community from Adam Tow, a long time Newton developer. On occasion, your steno machine may develop a problem -- a problem bigger than, say, your cat sitting on it. When that happens, it's time to call your local steno doctor! Clicking the Call button causes the Newton to produce touch tones that correspond to the number you wish to dial. Simply pick up your phone, hold the Newton close to it, and click the Call button. Ideally, the phone will dial the number, just from the tones. Sound farfetched? Well, how about this one: There was a guy once who could whistle into the phone, and actually dial a number. He was what was known as a "phone phreaker," and could not only whistle the tones, he knew how to whistle the correct tones to make free long distance calls! I recently purchased a new battery for my steno machine. You know, of course, the directions for these batteries say something about "cycle charging" a new battery. While I do know what cycle charging means, I don't have one of those Stenograph battery chargers ... so I simply put the battery in, and began using the writer. What's this got to do with the Newton? Well, I like to keep track of how long a charge lasts in my steno machine; this way, if I notice that I'm charging my battery more often, I know it's time to budget for a new battery. 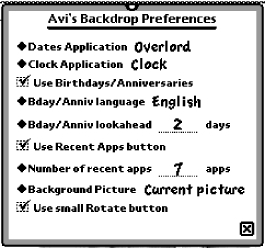 The Newton Names application works together with Newton Dates and Avi's Backdrop. I enter the birthdates in the Names application, it gets fed to the Date application, and also fed to Avi's Backdrop ... which, incidentally, is what tells me whose birhday is coming up when, and warns me about a week in advance. Kinda boring, huh? That's why I use Avi's Backdrop. Avi's Backdrop is a versatile application. Almost everything you see in the non-out-of-the-box screenshot does something. If I click on my name, I can select a different location. I have a location for work, where there's a different area code, a location for home, and a location for Indianapolis, Indiana -- where my daughter and grand daughter live. Did I mention you can fax from your Newton? Take a closer look at that picture about making the Newton speak. The little stick represents the battery, and the percentage next to it indicates the percent of charge remaining. The little thing that looks like a integrated circuit (say" chip") represents installed RAM, and how much free memory is available. 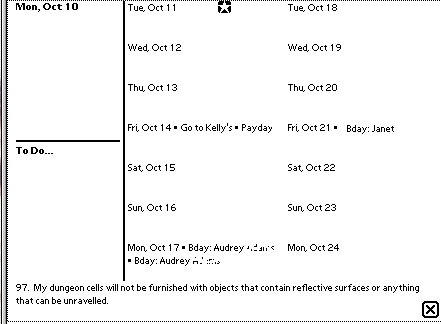 Sean Luke's Overlord is the application that provides that two week overview (and the quotes). If you have decided to go with the Newton 130, you will need this version. It only provides a one week overview though, but the all-important quotes are still there. I should point out something (fairly) important here. One of these cards (normally; not in this shot) is an ATA card. ATA cards did not exist when the Newton was created. In fact, the cards the Newton used to use are somewhat rare and rather co$tly. 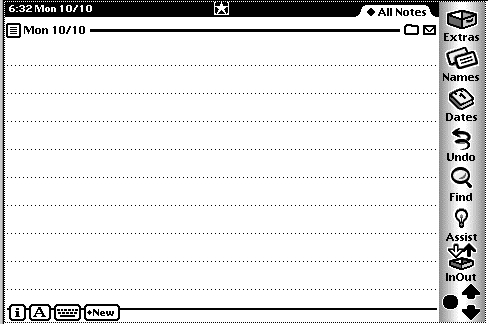 Fortunately, the Newton Community has (yes, you guessed it) Paul Guyot, who wrote ATA Support, which lets you use these new cards (NOTE: The current version does not support the Newton 130). The next little square turns on the backlight (though you can also turn it on by holding the power switch down for a couple seconds). While it is kind of hard to see in this picture, it does provide enough light to find, say, your glasses if necessary... or to find your way to the light swtich. Of course, if you've lost your contacts, you're out of luck! :o). The next button allows you to rotate the display. 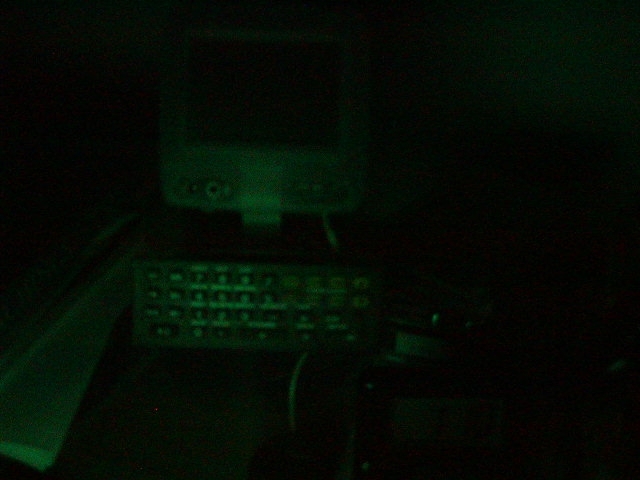 Comes in handy when you're trying to beam something to another Newton, and you want to match up the infrared ports (did I not mention you can send information from one Newton to the other wirelessly? Sorry about that ...). The next button shows you the last few applications you've run. Handy, because otherwise you'd have to click the Extras button, scroll through all the applications, and (finally!!) click the right one. You can use this to jot down a quick number, birthdate, etc. You can use the envelope there on the bottom right to send that note to the Notepad, so it won't get lost should your batteries fail (this is the only area where that might happen!). "Cool! What else does it do?" Well, how about e-mail? 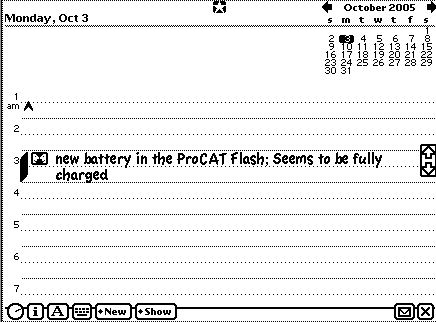 Anything you write on your Newton can be e-mailed. How about browsing the web? How about doing all this wirelessly? How about faxing? Anything you write on your Newton can be faxed. You know, for a dead platform, the Newton still does a lot -- some things better than its present-day competitors. Try J&K Sales, or Gem Enterprises, or Shreve Systems (though their prices are rather high) and (of course) there's always eBay. 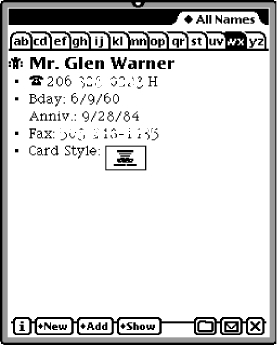 Don't like the idea of relying on handwriting recognition? How about an eMate? Try Wegener Media. 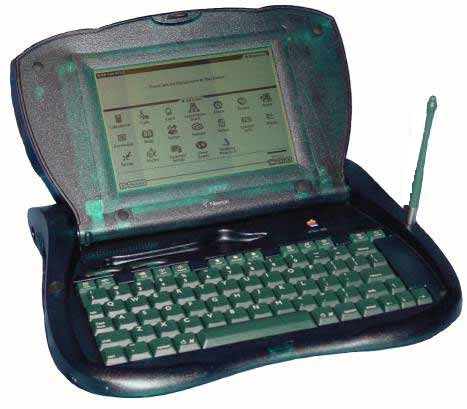 The Apple eMate: $60, but underpowered. Got one? Need software? Try UNNA (United Network of Newton Archives). Need Support? There's the Newtontalk list. There's more -- lots more -- but this thing is already 20 pages ...! "But Which One Should I Get?" In descending order: the 2100, the 2000 (note that the 2000 can be upgraded to the 2100 for about $45; check the JK Sales page if you need to do that), the 130, or the eMate (these last two can be considered interchangeable -- but ATA Support works just fine on the eMate). 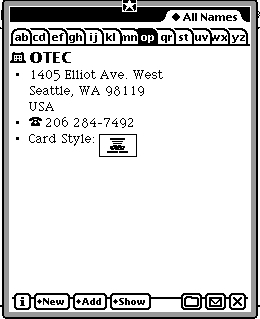 I should point out here that while the eMate is somewhat underpowered, it used to have an optional card you could install that would give the eMate four times the memory (from 1MB to 4MB). Alas, these cards are rather scarce ... but there is a man who reverse engineered an existing one, and built a few hundred! He's sold out now, but check his web page from time to time. If you go the eBay route, look for that memory card in the listings. Oh, and don't forget to do a full backup before you install it; if you don't, everything (less the installed applications) will be gone! Hopefully this brief look at the Newton has piqued your interest -- at least enough to try that $60 eMate. If you don't like it, you can always give it to some deserving kid ... or if you do like it, you can still give it to said kid -- but not until you buy that 2100! Good luck ...! Or, as we rabid Newton users like to say, "Keep the Green!"